This merging of the „We Can Do It“ World War II-era propaganda poster from the United States with the motto „Kraft durch Häkeln“—a spoof on the Third Reich-era program for social benefits, „Kraft durch Freude“ (Strength thru Joy)—is in no way meant to indicate support for either warfare, militarism, or National Socialism. 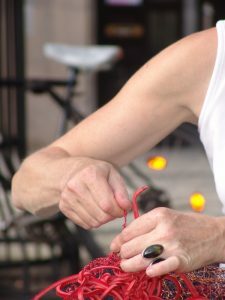 Around 2000, the artist’s passion for crocheting wire grew out of her love affair with wire from the 1990s, a logical extension of her artistic program of making metal and wire ‘softer’ by means of handcraft techniques such as sewing and twisting. Since the only tools necessary for such handwork are wire, wire cutters, a crochet hook, and a bit of patience, this work had one important advantage: the artist could do it wherever she found herself. The majority of her wire crochet work has therefore been done in social, public spaces, and it has again and again been interesting to experience how crocheting wire in public spaces—as the wire is continuously jabbed, hooked, slung, and pulled by dancing fingers—seems to work as a chaotic attractor for conversations and ideas. And, as is common in those jokes about potholders, comes, “can I touch it?,” a “but that’s different, softer than I thought,” or “why don’t you . . .,” “you could also,” “have you heard of . . .,” and “I know someone who . . .” and conversations about patience and strength, time and tradition. And as with so many ideas that take on a life of their own, Kraft durch Häkeln (Strength through Crochet) began as a joke made by a German friend when he saw the muscles that the artist was developing through crocheting wire.